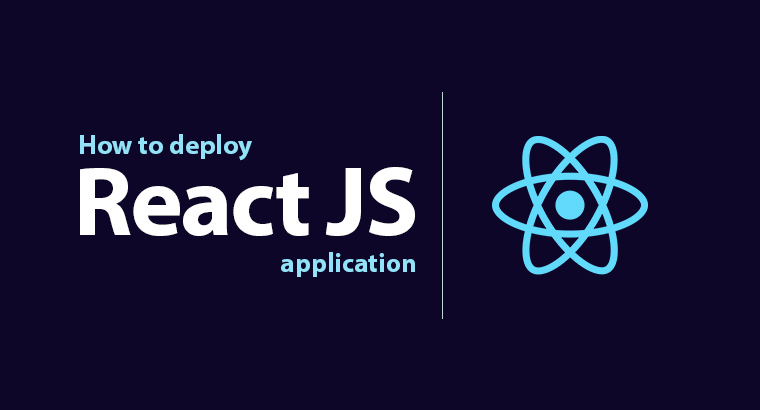 Its easy to find a getting started tutorials online but most of them miss out the final phase the deployment part so this will be a "how to guide" to deploy a react js app, will only cover deployment. I will be referring to react js application as react app or react application. In here I'll demonstrate two types of deployments, one on a static file hosting service (AWS S3) and second on a conventional server using a react project build on Create React App. Deployment will be done using CI/CD ( Gitlab Pipelines ) to AWS S3 and also conventional method where build is done on local system and transferred to server. Includes a basic snapshot test using Jest to demonstrate integration with Continuous Integration. Note : This method is applicable for react JS app that works on API to connect to a backend service or if you are building a static react JS website. If you have integrated the react JS within your Rails, Django or any project you have to use different method to deploy depending on application. Getting started materials are everywhere on the Internet and its easy to pick any one and get going because the subject knowledge at that point in time would be minimal or none. Once you are in final or deployment phase you would be looking for a perfect solution. So I would like to tell there are multiple ways to deploy a react js app this is one of many, feel free to change steps in CI/CD process as per your need. Test: Testing ensures all your components are working as you planed it to be. Move to Server: Next part is straight forward you need to move the build files to a server. In here you would do the testing and build process locally on your machine and the generate files will be transferred to the server. 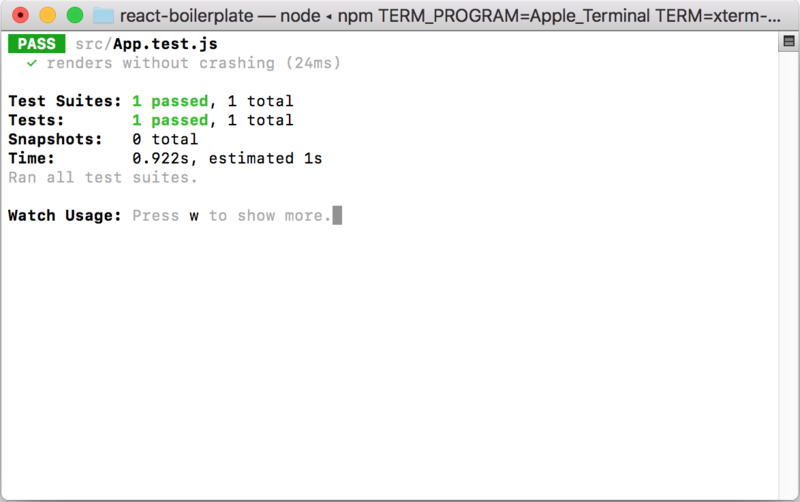 npm test will get the jest suit running, jest only runs test for files that are changed since last commit to save time but you can run all test if you choose to. If you see all green you can moved ahead and build the package. I won't mention testing as an optional step, its highly recommended you do testing in all your application. 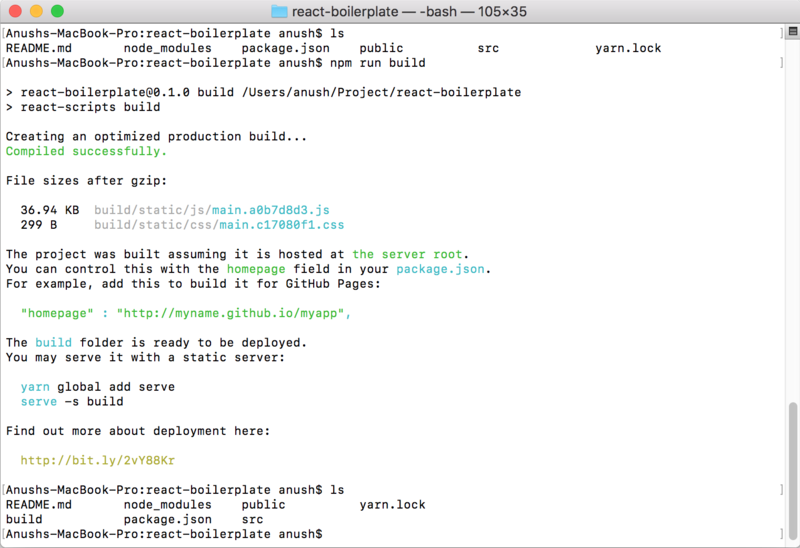 Execute npm run build in the application directory and you will get the project compiled and build into bunch of web documents in build directory. Once you transfer the content of build directory to server your application will be up and running. If you choose to set up your deployment via CI/CD great you are moving along, it looks hard to setup but its gonna be a piece of cake later on. If you are new I'll explain what a Continuous integration is before we proceed further, Continuous Integration / Continuous Deployment (CI/CD) is a development practice where each contribution (commit) by a developer is verified by an automated build, automated tests and made ready for deployment in single clicks. In this tutorial Gitlab Pipelines will be used for demonstration you can use any other CI/CD of your choice. In a CI/CD the entire process of testing and building is done on the CI/CD Server, the server needs to be configured with the required packages for your application, It can be done every time CI/CD server is run but it takes a lot of time and resource so its recommended to use docker image with all requirements build. Docker is container service which helps create environment in container. You can find more on docker. I'll publish the image and image repository, you can use the image directly but I'm not sure how long ill be able to keep it updated so it would be great to build an image for your project yourself. React JS Testing and Building. Deploy / Transfer Build to AWS. You can use a single image and install the packages in one but to keep them redundant and independent I'll use 2 separate docker Image. 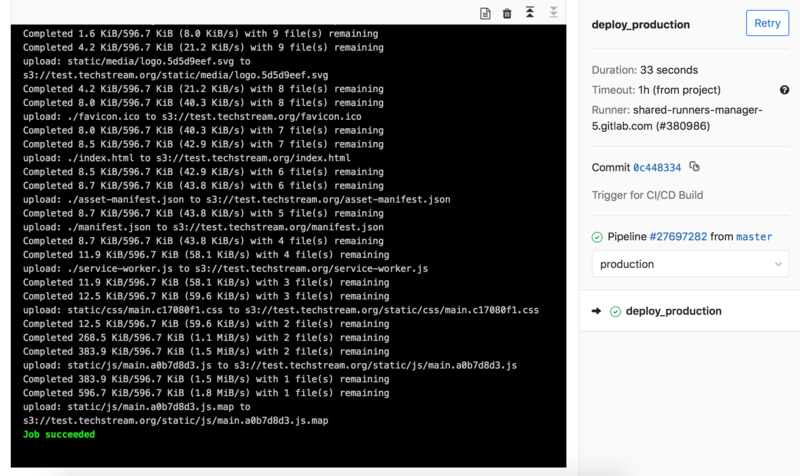 # Dockerfile for React JS Testing and Building. Let's configure the CI/CD to perform the deployment test, build and deploy it to AWS S3. This tutorial will use Gitlab for CI/CD you can use any other CI/CD service of your choice. The configurations will need some change though. In here we will be using a 4 stage process for testing and deployment. The Deployment process will be programmed to stop after completing the deployment onto the staging server and the deployment to production is done manually. This is done so that not every commit disrupts the production with a new change before further testings in staging to check for any possible errors before updating the production. The files of each build ( second stage) is stored as artifacts so they can be used for redeployed again without having to rebuild and also for deployment to production in the 4th stage to maintain consistency. Configuring CI/CD on gitlab is straight forward you need to include .gitlab-ci.yml file with all configurations for your CI/CD methods. # stage needs manual triger to start. If you noticed in the gitlab CI/CD config file there are variable with $ in-front, these are session variables. These variables are to be passed on to the environment when its being executed, these have to be specified in Gitlab repository setting. Most of the are secrets or session dependent variables so be careful to whom you share these variable values with. Here is the list of variables needed for using the above CI/CD Config, you have to specify its value in Gitlab Repository settings. I have explained where you can find the values for these variables below. To configure session variables go to Settings -> CI/CD -> Variables . Let's step and connect amazon web services to Gitlab to perform the seamless deployment. 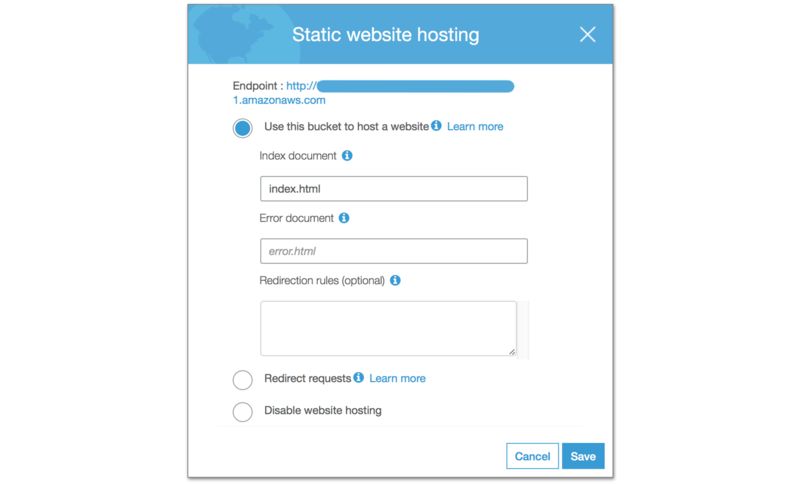 Create an Amazon Web Service S3 Bucker use the default settings (unless you know what you are doing) and choose region of your choice. You need to find the region code for the region you choose for your bucket from AWS Regions and Endpoints to fill the value for AWS_REGION. Enable static web hosting for the bucket. Open Bucket Settings > Navigate to Properties Tab > Click on Static website hosting. Check Use this bucket to host a website and Fill in index document as index.html and hit save. Make sure to note the Endpoint value this will be AWS_STAGING_URL or AWS_PRODUCTION_URL depending on which bucket you are creating. Now you need to set Permission for the bucket. Navigate to Permissions Tab > Click on Bucket Policy. Replace <bucket-name> with your bucket name. You will be get a warning "This bucket has public access" thats expected. Repeat the above steps to create one more bucket for production. 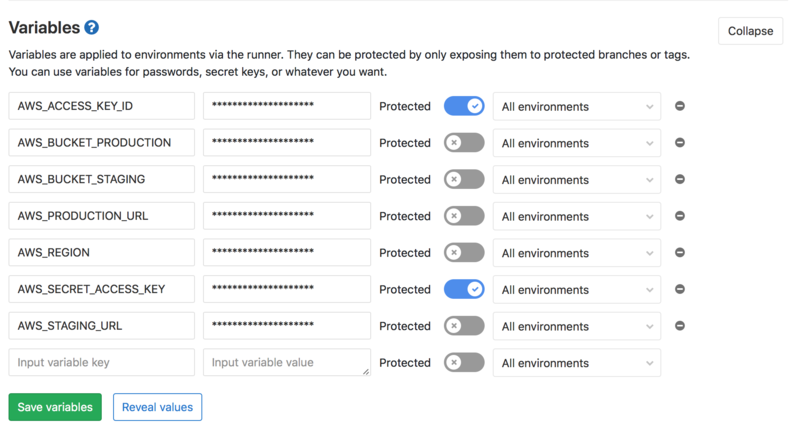 Navigate to Your Security Credentials (Top Navigation Bar ) you will be prompted with a popup asking to use AWS Identity and Access Management (IAM) users with limited permissions, Click on Get Started with IAM Users. If you didn't see the popup click users from the sidebar. Click Add a user, fill in the user name and in Access Type check Programmatic access : access key ID and secret access key and move to next step. In permissions create a new group, give an appropriate name and choose AmazonS3FullAccess for the group. Now any new commits pushed to the repository will trigger the CI/CD and each stage will be executed based on your settings. Once you verify your application on the staging bucket you can start the deployment to production by triggering the play icon on the deploy_production stage. The same artifact will be used for deployment on staging and production, to get consistent and avoid any further errors. Your application will be accessible on the AWS S3 public URL, you can replace It with your customer domain by setting "A Record" to the S3 URL or redirecting the traffic via Amazon Cloud Front.